Revant’s debut novel, Selfienomics, is a guide that attempts to enhance our quality of life by broadening our mental horizons. Through the span of these eleven chapters, he pays close attention to the various facets of our lives, drawing our attention towards how we could be living a more positive and healthy life. 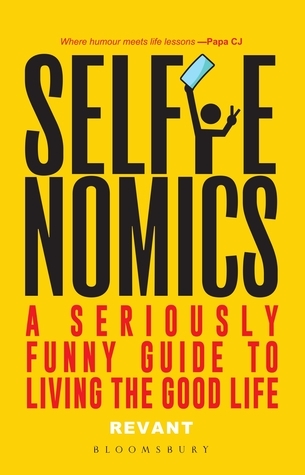 Interspersed with quotes and pop-culture references that back the various points made, Selfienomics induces a retrospective sphere wherein one is compelled to look at their perspective on matters of importance. It presents us with the information needed to make our own well-informed opinions. Since I don’t read a lot of non-fiction, I wasn’t sure to what extent I’d enjoy this one. Any initial hesitation on my part, was wiped clean soon after. 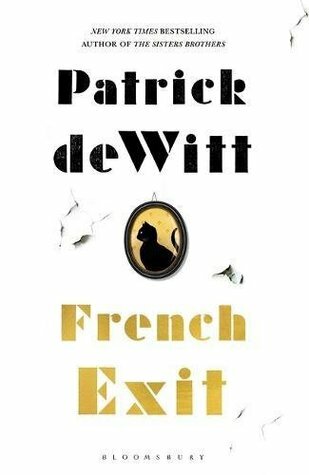 Revant’s witticism and flair for writing shines through from the beginning. He makes use of colloquial language, generously adding tons of hashtags and Hindi words. Fear not, for those who aren’t familiar with these non-English words and references, there’s a glossary of sorts at the back. What I found to be unique and surprisingly, very likable is the fact that he uses several business theories & principles to explain human sensibilities. And they made total sense! Humor is definitely one of the author’s major strengths. Almost every five minutes, I was laughing out loud. While a majority of the instances delineated in the book were relatable, there were some that weren’t. At one point, I thought the finance aspect got a little too much, but then out of nowhere he’d drop a little joke and I’d be clutching my stomach with tears of laughter. I love how this book employs a great deal of positive psychology elements such as good life, health, ambition etc. Moreover, its informative, so you glean a lot from it. There’s a Dialogues and Discussion section at the end of a topic, which helps you get a better understanding of what has been spoken about and what your values are. Revant makes a lot of realistic points, encouraging the readers to rethink their POV. He prods you to question everything you’ve learnt – be it about God, nutrition, time, jobs, society and much more. Like Derrida’s theory of Deconstruction, he systematically breaks down our thought process, highlighting how we get accustomed to think the way we do. Even though there are some things I don’t agree with, I believe that was the point of the book – to bring you clarity about where you stand. Overall, I absolutely loved this book. I’d read it again and again from time to time. I’ve probably said this multiple times before, but this book is HILARIOUS and yet it doesn’t take away from the seriousness of certain issues! It is a must read for everyone, no matter your tastes in books. I urge you to pick it up right away. “No manual?” appalled, she asked. Martha was running late. Her mother had demanded that she get a friend of some sort, they were all the fad. She was in for a beating, lest she quickly figured out how to work one. “Well, from what I’ve observed, they are a jolly bunch. One turn of they key and they jump a mile. They talk incessantly and are rude as a bear. ” supplied the shopkeeper. “Ma’am, we don’t make ’em. That’s the way they are.” She could see that she had begun to annoy the shopkeeper with her relentless questioning. “No guarantee?” Martha was beyond horrified. Why would anyone associate with something so entirely unpredictable? They all look the same, but they ought to behave differently, she pondered, glancing at the display. “Leave them be, Ma’am, if you care not for company.” the shopkeeper suggested. He could guess that she wasn’t exactly what one would call forward. “Would you take them back if.. if they weren’t.. suitable?” she ventured. “Twenty coins please.” She paid up and the shopkeeper activated the life sized figurine. “Good day, Ma’am. ” He bowed to her. She nodded an acknowledgment and turned to go. For the first few minutes, her new friend said nothing. When Martha stepped out of the shop, she noticed several people having a gala time with their friends – singing, playing carefree on the streets. It seemed to her, that friends were manageable, after all. But then with an alarming cry of joy, her new friend jumped into a puddle and looked at her gleefully. Martha’s overcoat was of no help against the onslaught of mucky water. “It is such fun. Join me!” she beckoned to Martha. But Martha was growing even more furious by the second. It must have shown on her face, for her new friend looked about uncertainly and upon finding no solace, took a leaping start. “Catch me if you can!” she hollered as she raced away, leaving Martha dumbstruck and angry beyond measure. “Just you wait!” she shrieked. Friends were a boisterous thing, she thought, as she ran after the retreating form. If she had learnt anything at all, it was to treat them with the utmost care. Who knew when one would blow up in one’s face? Happy Friendship Day to all my cherished ones! 😀 You continue to fuel the party that is my life. I am ever so grateful. 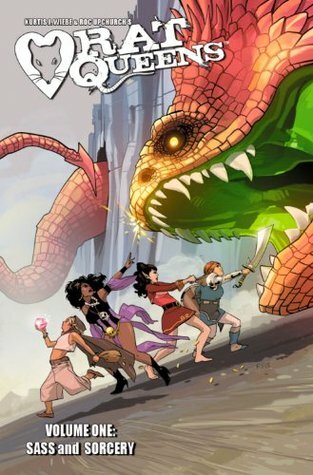 Rat Queens is a graphic novel that follows a group of four fierce women – Hannah, Dee, Violet and Betty – who work as mercenaries to earn their living. In a kingdom filled with several adventuring troops, the Queens feel that they aren’t treated fairly. So when an assassin is hired to kill the Queens, they set out to unearth who hates them enough to want them dead. Titled Sass & Sorcery, this volume comprises of exactly that. The four female characters are as diverse as possible, each putting up their best front forward while carrying troublesome baggages of their own. They are all kickass, and well sketched out characters. The art work is brilliant and is even more enhanced by the fast paced plot. The panels aren’t entirely symmetrical, which you’d think would disrupt the reading but it doesn’t really. I love the friendship between the four girls. It is believable because it is not shown to be perfect. They bicker, break up and finally, get back together because they know what matters at the end. Hannah and Sawyer’s relationship was a little predictable. The content of the volume is very violent and gory. I didn’t mind it one bit. But there may be people who are disturbed by the sight of body parts, even if they are animated. Apart from that, the plot is interesting enough to make you read all of it in one go. I started the next volume immediately. 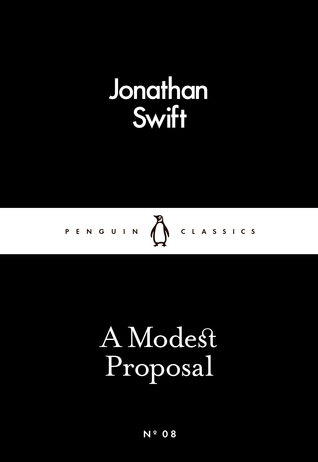 In this Little Black Classics volume, Penguin has put together a bunch of short stories written by Jonathan Swift, whom we know for his popular work Gulliver’s Travels. While a majority of the pieces in this book is satiric in nature, I would like to draw your due attention towards the first piece titled A Meditation upon a Broomstick. Herein, he places surprising emphasis on the life of a Broomstick, comparing its features to that of humans. His rumination of how a broomstick lives out its usefulness, much like human beings is startling, albeit true. Other texts like A Modest Proposal, An Examination of Certain Abuses, Corruption and Enormities in the City of Dublin, A Short View of the State of Ireland follow the standards of life in Ireland. His indignation at the poor state of affairs in Ireland, because of lack of policing and enforcement of laws, meddlesome countries and even the corruption within Ireland are reflected in the sarcastic tone of narration. I rather enjoyed reading this collection of stories. While there were tons of cultural innuendos that I simply couldn’t grasp, I was definitely able to understand what was being spoken of. My two favourite pieces from this book are A Meditation upon a Broomstick and A Modest Proposal. Some may find the content of A Modest Proposal extremely horrifying as he suggests eating children to solve the problems of poverty, famine etc. But it must be understood that it is a satiric piece, and Swift is not actually suggesting that people sell/eat their children. His writing style is interesting, complete with the capitalization of letters that one wouldn’t normally use nowadays. While written as humor, some of the sections are thought provoking. And I appreciated that about his writing. I’m looking forward to reading more Irish texts. I liked this collection of stories a lot better than some others that Penguin has to offer. Although I wouldn’t recommend it as light reading. If you’re interested in Irish Literature or satire, you should give this one a try. 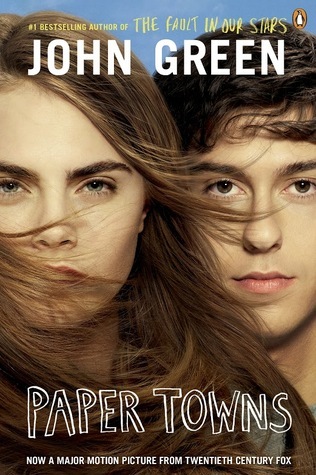 Paper Towns starts off as your typical high school story, complete with parties and prom, dating troubles and unrequited love. Quentin Jacobsen has always loved Margo Roth Spiegelman, his childhood friend who grew distant after high school politics got in the way. And so when she appears out of nowhere at Quentin’s window, demanding that he help her carry out an all night revenge plan, he complies. Unfortunately for Quentin, he gets his hopes up, beginning to wonder if they will finally become the friends they were meant to be. However, the next day presents a varied truth. Margo has not only gone missing, but she’s left behind clues with which to be found. As Quentin and his friends embark on a speedy road trip, they begin to wonder if they had ever really known Margo at all. 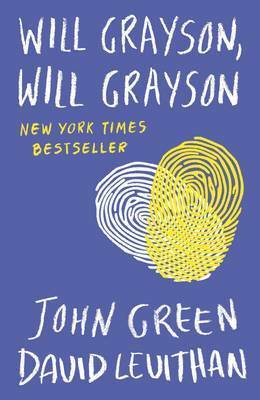 Having read a book by John Green before, I was certain I would enjoy this one. But I hadn’t expected to absolutely love it. Not even three-fourth into it, did I think it would be a book worth reading again. But here’s where John Green’s writing bolsters the story. The last few chapters become so much more than a high school story. The philosophy behind it all is sure to reach out to anyone, as we are all merely trying to find our place in this world. Interspersed with several Whitman quotes and references to other literary figures’ works (which I loved reading), Paper Towns shows us that paper (two dimensional) people and paper places have a life of their own. The moment something is put down on paper it is infused with some of the creator’s soul. The idea behind the paper towns reminded me of Wislawa Szymborska’s poem, The Joy of Writing – “Why does this written doe bound through these written woods?” In keeping with this idea, Margo becomes one with her writing. Her escapades enact her, rather than the other way around. For a majority of time, I disliked the character of Margo Spiegelman. She appeared to be insensitive to Quentin’s feelings, was rather self centered and attention seeking. And throughout their road trip, I kept wondering why they didn’t turn around. Why were all these people incessantly looking for a person who didn’t want to be found? But you come to understand, as did Quentin, Margo’s perspective towards the end. While it isn’t ideal, it is understandable. While road trips are all fun and games, it does test your strengths. This scavenger hunt of sorts definitely increased the appeal of road trips for me. Quentin, Ben and Radar’s friendship was one of the highlights of the book. They are the kind of friends who would set aside even the most important of matters when the other needs them. I wished Margo could have better understood Lacey. They could have been fast friends too, after everything Lacey did for her. There’s enough humor in the book to crack you up occasionally. It was a splendid story, one that I will read again. I recommend it to all those who haven’t read it yet. Ratings – 5 stars on 5. Disclaimer – The images in this post have been obtained from Google. I do not own any of the images. Shin Min Ah and So Ji Sub starrer Oh My Venus is a Korean romcom drama that explores the importance of outward appearances and perseverance as a determinant of success and confidence. Kang Joo Eun has always been the center of attention during her high school years. Aspiring to be a lawyer, Joo Eun grows up only to realize that her life isn’t turning out to be the way she had hoped. Having gained tons of weight, Joo Eun not only faces the stress of being an overworked lawyer struggling to find justice in the tangles of rigid laws but also is dumped by her boyfriend of 15 years. Nevertheless, luck is on her side and she chances upon world famous trainer John Kim. Together they persevere to solve their respective problems and somehow end up on the same path to recovery and bliss. Kim Yeong Ho is the next in line to take over his family business, but word is that Yeong Ho’s passions are a tad bit different from what his family expects of him. With a dark past and an even drier future, how will he manage the best of both worlds? Shin Min Ah and So Ji Sub together in a drama? As main leads? Check and check. What more could I want out of a kdrama, especially when the plot is as heartwarming as this one. One could assume that the drama seems to advocate good looks as being essential to finding love (especially when Im Woo Sik breaks up with Joo Eun) or attaining success in one’s job but I think it places emphasis on the need for exercising and staying fit. It is a given that the two leads are meant to be but they got together rather quickly in the series and so you are left to wonder what more is in store for them. I was very apprehensive of the fact that their relationship may become draggy and extremely cheesy. But the conflicts that were introduced in the drama kept it going at a good pace and there were times when I was rooted to the spot, waiting to see what would happen. The drama has a good proportion of humor in the sense that some of the scenes are legit LOL-worthy. The drama is an example of what motivation and support can do for a person. It proves to us that with the right dedication, one can overcome even the greatest of difficulties. Jang Joon Sung too deals with a troublesome childhood. But with the help of Yeong Ho, he goes onto become a boxing champion. Their brotherhood is shown to be unconditional. Woo Sik and Soo Jin’s relationship is very lovable. They complement each other well. Even though Soo Jin plays the anti-heroine, causing problems for Joo Eun, she is actually very sensitive. The end to Woo Sik & Soo Jin’s story was apt and I couldn’t think of a better way to wrap up things. One of the other things that stood out in this drama was Kim Ji Woong’s chirpy nature. His constant “Ma’am, Ma’am” was an absolute delight. The soundtrack of the show is too good and it mixes well with the scene to enhance the sentiments being enacted. This drama is simply amazing and has become one of my all time favorites. I would definitely recommend it to all. Will Grayson is overshadowed by his friend Tiny Cooper. The second Will Grayson is pining over Issac, a boy whose virtual presence is a blissful respite. Then Tiny Cooper goes and makes a play about a certain Phil Rayson which inevitably upsets Will. Simultaneously, a plan to meet Issac goes horribly wrong and upsets the other Will. Both Will Graysons, existing in a space contrary to one another, are distraught. Somehow, they meet each other and from there, it’s only an uphill climb. This being my first John Green book was an absolute delight. The writing is hearty and while depicting very realistic people with genuine struggles, makes you fall in love with the story. David Levithan’s chapters were more blunt and unrestrained, in the sense that it portrayed the second Will Grayson as being stark, a little hard hearted. The chapters altered between both Will Graysons’ perspectives and was a welcome change of thoughts. While the theme of homosexuality is explored largely, we also come to terms with concepts like independence, unconditional friendship and irrevocable mistakes. Even though Will gets mad at Tiny numerous times, their friendship is far removed from trivial fights. In that, Will not only commends Tiny’s confidence and kind heart, but is also able to get past his annoyance at Tiny eventually. Tiny Cooper, though associated to both the main characters, shines through like a protagonist. His rapidly changing love life does not deter him in the least bit and when the time comes, does not prevent him from making a more heartfelt commitment. Both the Will Graysons are able to grow exponentially due to Tiny’s interference in their lives. The novel doesn’t speak much about their respective families and I guess its alright, because they all come together like one big family. The play that Tiny takes charge of ends on a brilliant note and is representative of the wonder that Tiny is. Will Grayson and Maura’s friendship is typical in a lot of ways and it was sort of predictable. I flew through this book and enjoyed every bit of it. I just wish the ending had been a little more elaborate and less ambiguous. But I definitely recommend this to all contemporary lovers out there. A fun, well packaged story. Ratings – 4 stars on 5. 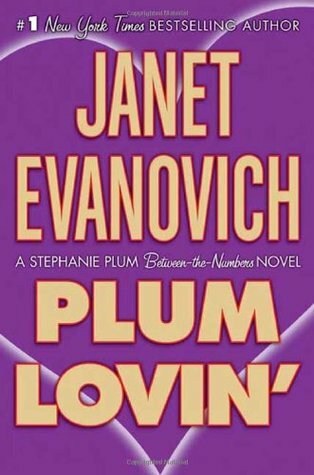 Plum Lovin is a short novel in the Stephanie Plum series by Janet Evanovich which is centered around Stephanie’s attempts to take over Annie Hart’s business as a relationship expert while Diesel protects Annie from an irrational goon with supernatural powers. Annie, wanted for murder, is on the run and staying out of the radar. Stephanie is under orders to capture her at all costs. Only Diesel knows where she is and he drags Stephanie into helping Annie with the promise that he’ll hand Annie over after everything has been sorted. So bounty hunter turned match maker, Stephanie wades through multiple relationship drama while dealing with her own problems, hoping to solve them all. Not having read any Janet Evanovich book before, I didn’t know what to expect. This book seemed to be more of a romance genre than mystery/detective. It starts off with Stephanie talking about her boy problems and how she is confused or juggling between three men in her life. She has been assigned the task of capturing Annie Hart for murder but somehow gets sidetracked into managing Annie’s match maker job. A good majority of the novel is spent in finding ideal matches for Annie’s clients and Stephanie herself getting drawn in by Diesel’s charm and classy nature. We are made to believe that she is pushing him away but its clearly evident that she is somewhat besotted with him. I didn’t like it much because a lot of it wasn’t believable. And I am not even referring to the supernatural powers that Diesel and other “unmentionables” have. The power to inflict a rash, while being extremely out of the box, is surely not worth the hype. The writing style is good and easy to process. I just wish there was more content and the characters were more grounded. I don’t think I will be reading any more books from this series cause I couldn’t connect with the protagonist in this one. I highly doubt I’ll be able to understand her antics in other books. If you are into books that are tethered to the love angles between most of the characters, then this one’s for you. Ratings – 2 stars on 5. Can You Keep A Secret? 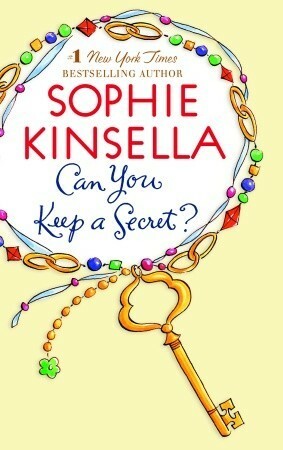 by Sophie Kinsella is a book based on the protagonist, Emma Corrigan, and her dire inability to control her tongue. More than often she lands herself in big trouble. One plane ride, drunk and absolutely in no control of her senses, she blurts out every single secret of hers to the passenger sitting beside her. Later, in a more sober state, she is horrified at the blunder she made. As a human, naturally she tries to justify the mistake by thinking that its not as if she would meet that person again. Wishful thinking that was! The Gods seem to have something else in mind for her. When she finds out that the “stranger” is none other than her new boss, she is utterly humiliated. How is she to ever face him, especially when he knows every embarrassing detail that she even hid from her bestfriend?! I love Sophie Kinsella. Everybody knows what a FAB job she did on the Shopaholic series. What’s not to love about her books?! This one is just as fantastic as all the others. Its a light, girly, rom-com read. Emma Corrigan is a bubbly character with a wee bit of self-esteem issue. As in she is keeps dwelling on her problems and drowning in self pity. But then again, it gets a little hard to switch on the positivity when you think your parents prefer your cousin over you. So its understandable. She is also the kind of person to say a lie than speak the bitter truth just so as to please the other person. So one by one, all that keeps piling up and she is soon entangled in a web of lies. The book was hilarious, down right to the ROFL moments. I couldn’t help laughing out loud a lot throughout the book. You can totally relate to Emma’s thoughts (at times! ), they are quite amusing! The author has portrayed her character well as a city girl who loves branded goods and works to have a good social standing among her colleagues. I did pity Emma. A lot. Its not fair how her parents treat her as if she is some third wheel. They totally stab at her sense of belonging, making her feel like an outsider. On purpose or not, they should’ve been more supportive of her. Then we have the handsome “stranger” who is privy to Emma’s deepest darkest secrets. Jack Harper, being the male lead of this novel, is a gallant and amiable character. He may appear to be all authoritative as the CEO but there is also playful side to him. He is the helping hand that Emma reaches out to.